Alien Explorations: Radio Times illustration by Clare Melinsky for "Australia: A Long Way Home" from 21 February 1980, is referenced in Giger's painting N.Y. City XXII (1981)? 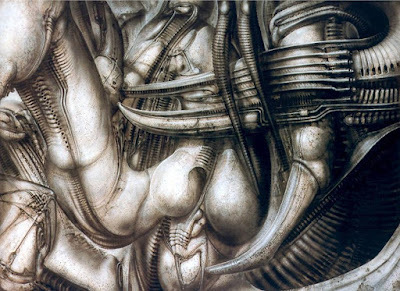 is referenced in Giger's painting N.Y. City XXII (1981)? 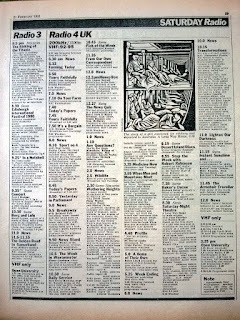 Giger references the Radio Times illustration by Clare Melinsky for "Australia: A Long Way Home" from 21 February 1980, in his painting N.Y. City XXII (1981)? 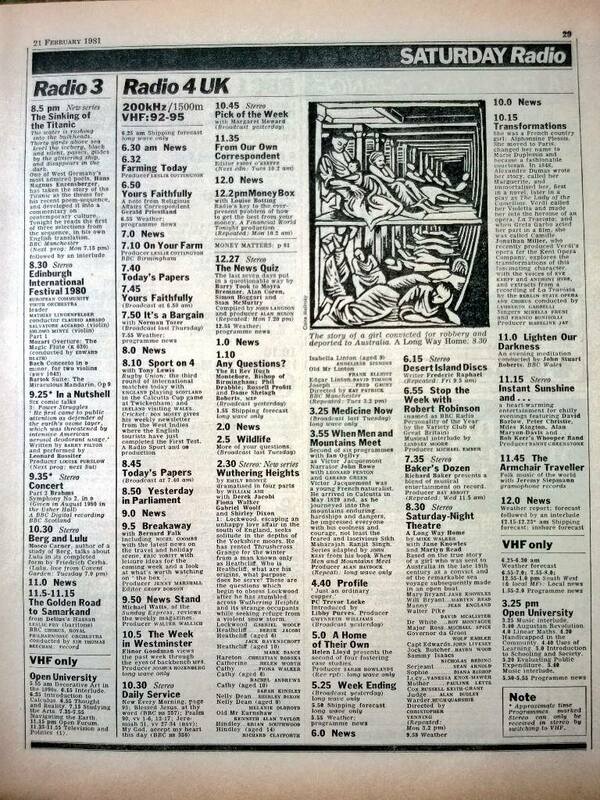 14th March 2017, looking through the Radio Times Collectors site on Facebook, I see the page from the Radio Times for 21st February 1980, and realise that Giger must have seen it, becoming interested enough to use it as reference in a painting. Looking through Giger's paintings, I suddenly see N.Y. City XXII (work472) from (1981), and see similarities within their structure. for "Australia: A Long Way Home"
As it goes, it is quite difficult to describe anything in Giger's painting. 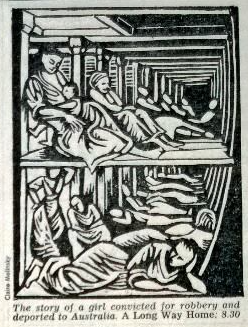 The part of the linocut used was generally lower three quarters. The legs and buttocks of the body lying across the bottom of the picture and the human standing up on the far left merge together as a sort of a leg like limb with buttocks. The left corner of the upper floor transforms into the calf muscle of the bent knee. The shadow filled curve of the right wall turn into openings in pipes. The highlighted curved vertical rib of the ship merging with the right of the collar of the human lying down, transforms into a curved claw like prong. The upper floor and perhaps the rows of human bodies going of into the distance, transform into the horizontal tusks like prongs .